Here at Latititude 56º North we get just 7 hours of daylight in mid-winter, the watery grey light is the colour of Tupperware! Barely enough light to keep plants alive if they originate from lower latitudes, especially if they are being kept indoors where light comes from just one direction through a window. I want to keep some pepper plants going through these dark days so decided to rig-up a LED grow light in my house. I have been very impressed by the brightness of these lights, certainly bright enough to keep the peppers happy. My African chilli peppers and huge Romero sweet peppers have proved to be very late to ripen so will really benefit from continuing into a second season when they should crop heavily. The plants are impressively big and healthy, they seem perfectly happy in small Air-Pot containers which are easy to squeeze into the limited space available under the lights over winter. 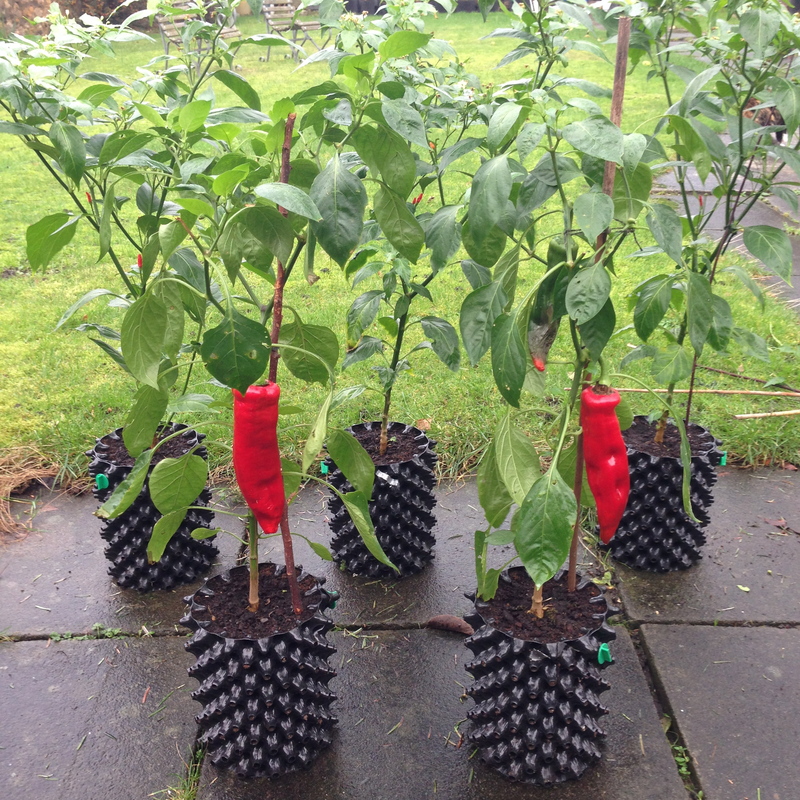 Heathy air-pruned roots will encourage good continued growth in Spring when the peppers can eventually be potted-on to bigger Air-Pot containers. Much better than the pot-bound circling roots which can develop in undersized conventional pots. The benefits of Air-Pot grown roots even from early stages of growth seems to set-up the plants for better develop throughout life so Air-Pot seed trays will soon be nudging out the over-wintering plants from under the lights. Hi, how are your peppers doing now? I’m very curious to find out what grow lights you bought and if you are still happy with them. I don’t have space for a greenhouse and would love to try growing peppers and salad leaves inside the house, but I’m put off because the whole hydroponics thing seems enormously confusing. I am pleased with the 300 W LED lights (Popular Grow, eBay) I have used to keep chillies growing through the winter, and for getting seedlings started early indoors prior to planting out when the weather is warmer. Grow lights emit a light of different wavelength to normal lights or sunshine, my lights are very pink and quite harsh to be around, so they are not compatible with living rooms unless you box / enclose the growing area. I agree soil-less hydroponics can be complicated, which is why I prefer to grow in Air-Pot containers using potting compost. Roots are in a natural growing medium and good development is encouraged by air-pruning and the well aerated compost, much better than the chemical soup used in hydroponic growing. 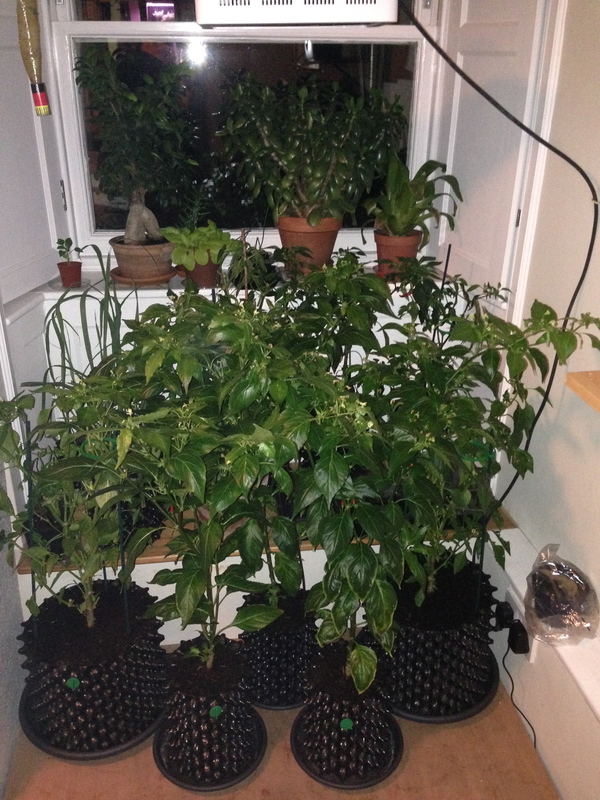 It is worth growing a chilli even if the only space you have is a sunny window, salads can go outside on a back step or next to the dustbins.